Riley’s Hot Dog and Burger Gourmet is a rather small restaurant that may seem hard to find, that is until the adorable dog logo is discovered. However, even though the building is small, the décor on the inside is pretty remarkable and eye-catching. The style of the restaurant’s interior is very antique and rustic. I felt as if I was living in the olden days when I was looking at some of the vintage photographs on the walls. The lights that were hanging down from the ceiling were also a nice touch to providing a great atmosphere. I have to say, the one thing that made Riley’s very unique compared to many other restaurants was its menu options. I honestly have never seen any of these menu items at another restaurant before, and the best way I can describe this menu is absolutely outrageous, in a good way. Riley’s menu has some normal dishes like the Classic American, Turkey, Veggie and Salmon burgers as well as the Classic and Chili Cheese dog that can be served with a side of fries. On another note, the menu includes some unique and interesting combinations. The list includes the mac and cheese burger, mac and cheese dog, dirty mac dog, jalapeño popper burger, jalapeño popper dog and the loco taco dog. There was also a side dish called Salty Balls (yes, that’s what it’s called), which is actually one of the most popular menu items. Salty Balls are basically potatoes that are salt-brined and can be served with either sour cream and scallions or melted butter. I ordered the mac and cheese burger with a side of chili cheese fries; I’ve heard nothing but great things about it. Despite how excited I was with all the positivity surrounding it, I still wanted to be the judge of how great it truly was. When my meal was served, I immediately fell in love with how it was plated. 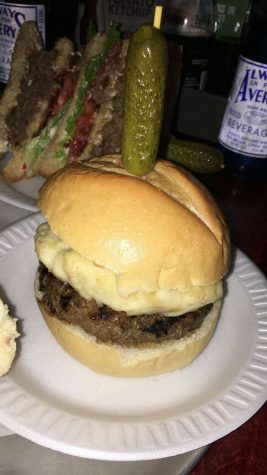 The mac and cheese burger had a short wooden skewer placed in the center of it and at the top was a gherkin (little pickle). There was something about the gherkin that made the presentation of the burger very astonishing and I can’t exactly explain why. The chili cheese fries looked delectable with the melted cheddar cheese all over them and topped with meat sauce. When I tried the chili cheese fries, I was surprised by the sweet flavor that was given to me by the meat sauce. Whenever I think about chili, I usually think of hot and spicy flavors. On the contrary, it had a unique sweet taste that was actually pretty pleasant. 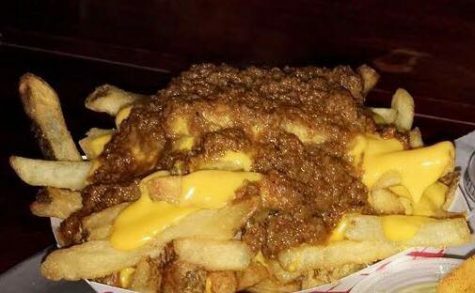 With the sweetness of the meat sauce and the cheesiness of the cheddar cheese, a delicious mixture was created and both went well with the fries. When I took that first bite of my mac and cheese burger, pure delight came from it. I was honestly impressed with how amazing it was. The mac and cheese on its own was very tasty and it had just the right amount of cheese incorporated into it. As for the burger, it was so juicy and the flavor of the beef was delectable and mouth-watering. Overall, Riley’s is a great restaurant that Central Connecticut students should check out sometime, especially if they’re in a mood for a great burger or hot dog that’s not fast food (no offense to fast food restaurants); all of their menu items are freshly homemade. Riley’s is located at 61 Glen St. in downtown New Britain.